What’s on your mind? Comment away! Merry Christmas; Happy Hanukkah! Photo looking up Middagh Street. Does anyone know what this new building is with the crane on it? Any renderings of how tall it will be and what the facade will look like? Thanks! 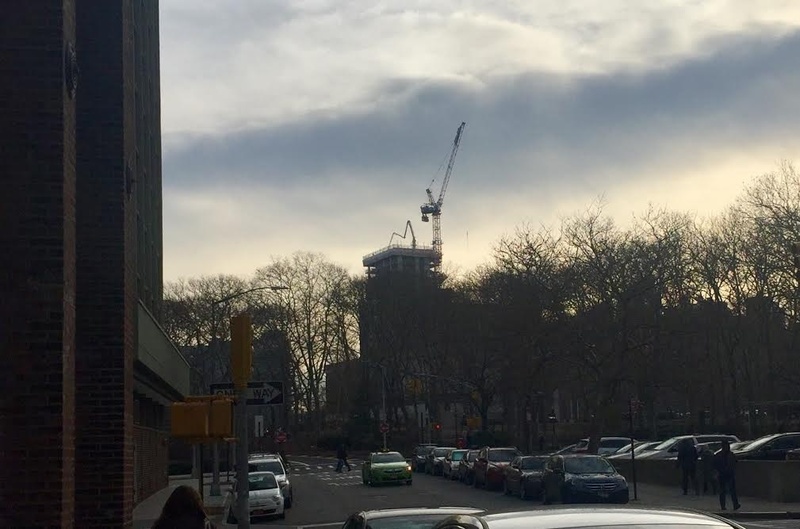 North of Tillary Street, could be on Jay Street or Flatbush Avenue Extension; there have been lots of new high-rises going up there in recent years. Bring back crabmeat a la Dewey! Bring back Gage & Tollner…. Beautiful. Please, no more tacky jewelry stores or Arby’s! Brooklyn scored $15 million for economic development, including $1,240,000 for Brooklyn Bridge Park, for an ice skating rink in Brooklyn Bridge Plaza, and $176,283 for the Brooklyn Historical Society, for an educational exhibit in a satellite museum in the Empire Stores complex. Hello – can anyone recommend a bar or eatery in the area that serves eggnog? I miss Pete’s Waterfront Alehouse and I’m looking for someplace nearby to satisfy my eggnog craving. Only apartments we are excluding from consideration are new buildings between Clinton and Court. Bravado, what is in the old space, serves eggnog. Brado is the name of the place. Amen. Fulton is such a who-knows-what’s-next mix right now. Is there an overall plan or is it Dodge City? Yes, please bring back Gage and Tollner! A classy joint. 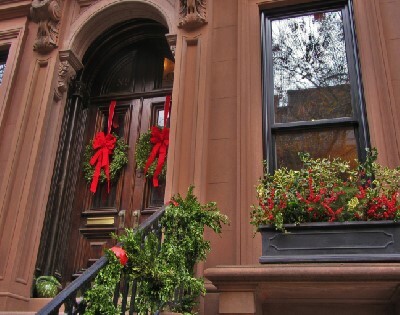 Check out Streeteasy dot com (I am not advertising – I have no interest in the site). There are plenty of good options in the Heights in that price range, including a decent amount of No Fee apts. 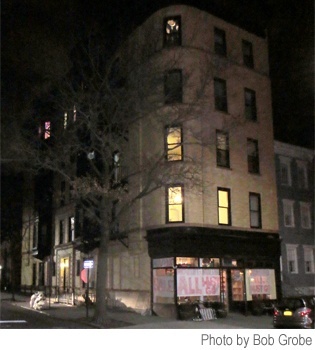 There is actually a listing there for 65 Montague (again, I have no personal interest). My wife and I looked there a few years ago. Recently rehabbed building – very nicely done. We opted for another apartment, but I really liked it. Good luck with your search. 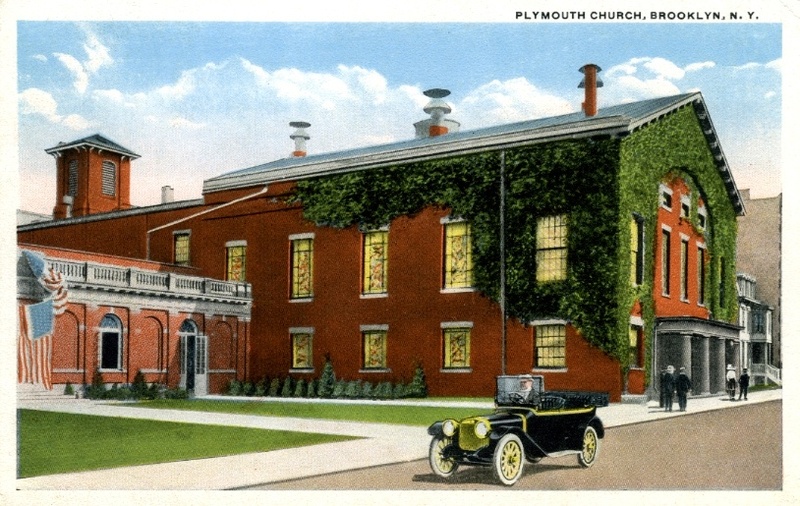 Saturday evening at 7pm, the festival of Christmas will be celebrated at Plymouth Church with a traditional service of lessons and carols, sung by the congregation and the Plymouth Choir. The service will end in candlelight. Perfect Paws, the dog-grooming place at 102 Hicks Street, the corner of Pineapple Street, is moving. First they said the building is coming down, which is patently absurd, but then that it had been sold and it is being renovated into new more expensive apartments, much like other buildings around the Heights of late. Secial Alert! (Christmas Eve) The Tree sellers in front of Key Food were over delivered Xmas trees from thier supplier. So they are left with a sizable number of surplus trees which are going to have to be trucked to mulch. Anyone who wants a tree possibly for back yard mulch or other garden purpose should QUICKLY go over to in front of Key Food and look over the really fresh trees just sitting there. WARNING…the pick up truck is coming SHORTLY…So SPEED is advised…. Please include the photo source, or delete if you don’t have permission to post. Thanks. A lot of other sites, including the Eagle, TheRealDeal, and Gothamist, aren’t afraid of angering the Internet gods. Why such concern on your part? Because it’s unethical and illegal. Because I have photographer friends whose work regularly gets stolen & used inappropriately. Because artists & collections have a right to say wherever & how their work is used, & to be fairly compensated. I will ask the admins to remove the photos, now & in the future, as I get the sense that you’re not interested in doing the right thing. Actually, just tried to delete it—and can’t. And my own photos have been re-used without my permission. Can’t help but wonder why the guy doesn’t just walk a couple of blocks and post his own picture? Bklyn84, I think the pic (now removed) was historical, which was interesting in itself. I don’t understand the fine points of copyright law (antique photographs that someone still has rights to? ), but there ya go.